Best cricket bat in the world | Khelmart.org | It's all about Sports. 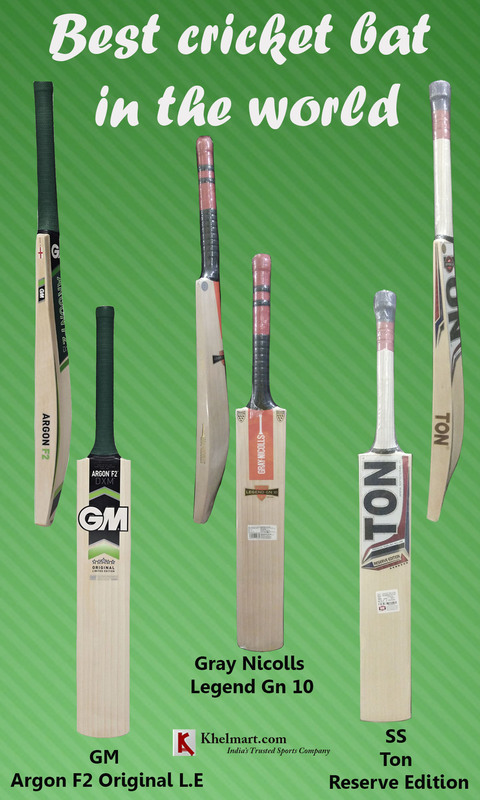 Cricket Bat manufacturers like SS, BDM, GM, Kookaburra are claim to manufacture best bat for professional players. Professional Cricket bats are considered as best bats in the world as it provide following key benefits to cricket players. 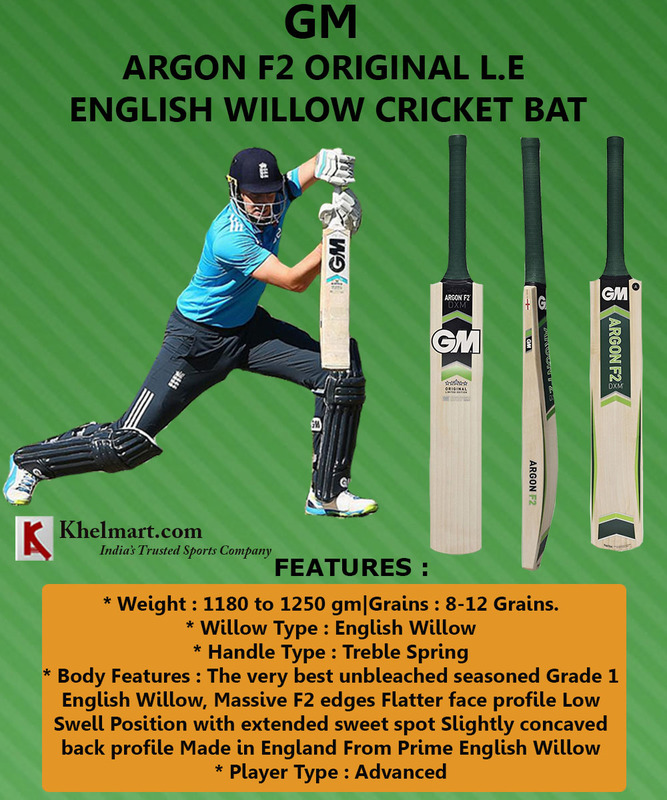 Developed in GM UK factory, GM Argon F2 is a world class cricket bat because it delivers best in class bat quality to player. 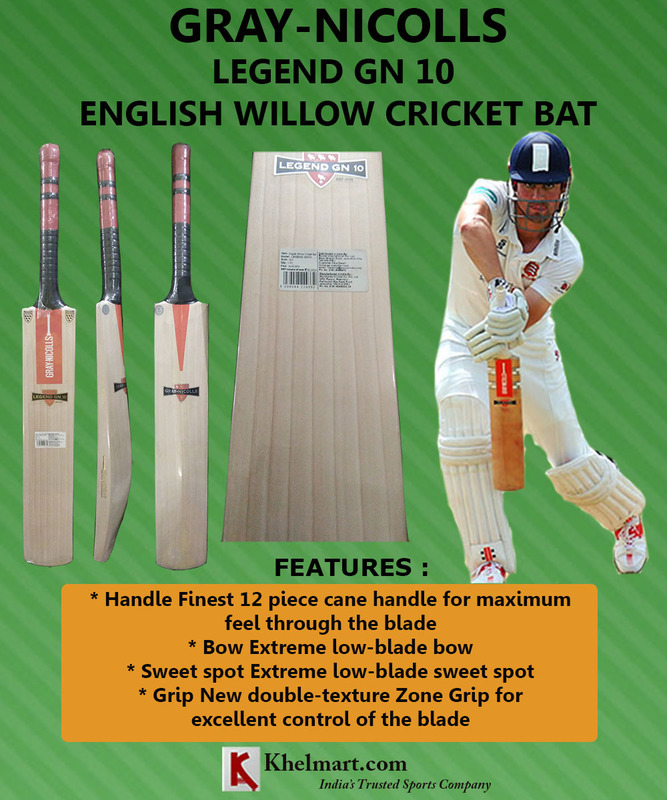 Developed with top grade English willow cleft, this cricket bat is developed for professional players. GM used F2 concept in the bat manufacturing. F2 is a concept which is developed for providing best in class bat performance. F2 is basically using best in class bat manufacturing technique Like Computer Aided Design and Computer Aided Manufacturing system by which each bat is developed with accurate dimension and specifications. As its name indicates, this bat is a legend series bat developed for professional cricket players. Made from Top grade, finest English willow and absolute innovative profile. Bat sticker covers very limited area so that player can see complete wood and ensures the willow quality. Gray Nicolls Cricket used tradition spine profile with innovative back profile. Bat Handle is made from 12 piece cane which offers best in class flex and optimum control. This 1st grade English willow bat is top line bat in Gray Nicolls Cricket catalogue. This cricket bat will offer best performance to all round type of cricket players. Legend GN10 bat is endorsed by Andrew Strauss. Bat comes with all new type bat cover with unique signature style. 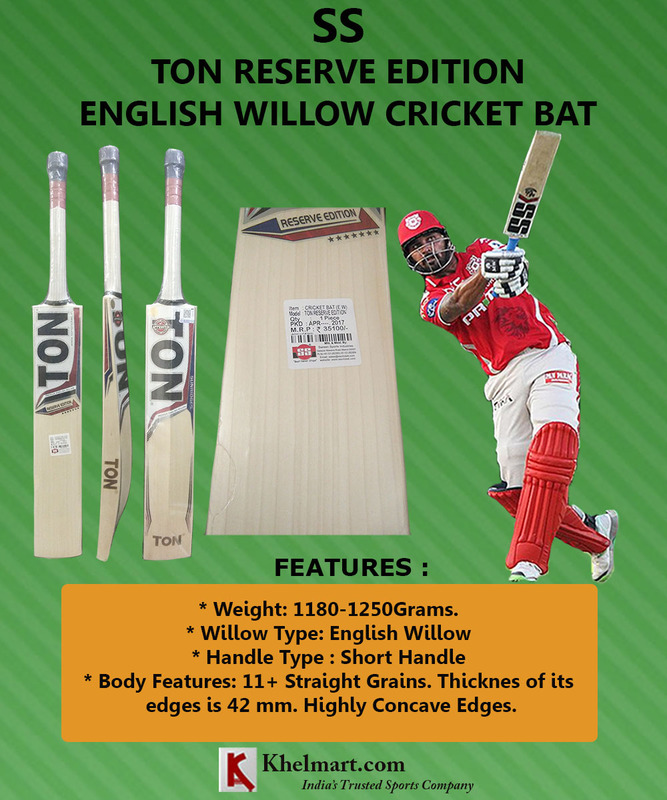 Reserve edition is top line cricket bat by SS Ton series. Made from finest top grade English willow cleft, this bat offers best in class performance for professional cricket players. Its sweet spot is located at mid to low position which offers better swing to player. Further, controlled concaving at back profile makes this bat lightweight in nature. Bat spine profile is traditional tread mark SS spine profile. It is a light weight cricket bat and player can get bat weight around 1160 gms to 1210 gms. Grains profile of bat is extraordinary and offer very clear grains with maximum numbers. Number of grains would be around 8 to 12 grains. Bat is fitted with 12 piece can handle which gives optimized flex of handle with better control. SS used high quality bat grip with will improve the overall bat grip performance. This reserve grade English willow bat is developed for professional level cricket player with all round type of playing style. These three English Willow Cricket Bats are considered at Best cricket bat in the world. This entry was posted in Cricket and tagged Best cricket bat in the world, Details of Best cricket bat in the world, Images of Best cricket bat in the world, Specification of Best cricket bat in the world. Bookmark the permalink.